This week I want to share what is probably my favourite salad. 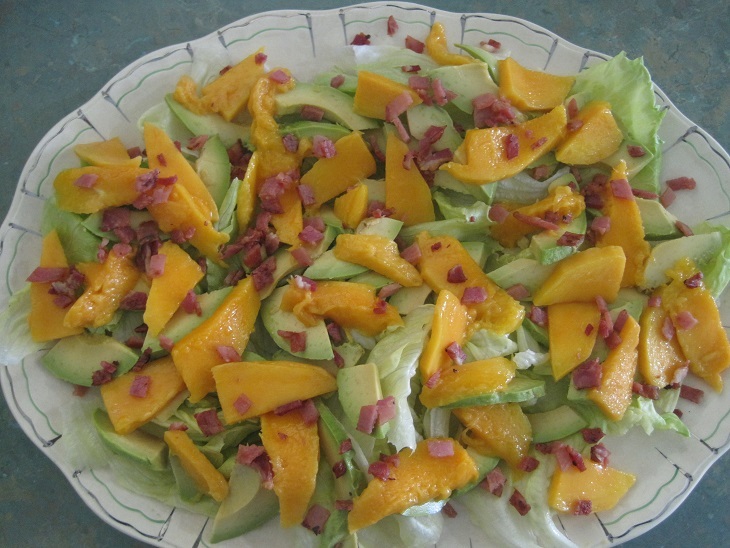 The recipe for this Mango and Avocado salad came from the Women’s Weekly BBQ cookbook which was published about 20 years ago. My copy of the book has disappeared in the intervening years but I make it pretty well as it was in the book apart from the dressing. The finished salad looks appealing and has a combination of textures. Spread the lettuce leaves on a large platter. Slice the avocado and mango. Lay the slices over the lettuce. Dice and dry-fry the bacon until crisp. Allow to cool and sprinkle over the salad. Chop the walnuts and sprinkle on the salad. Combine the ingredients. Add a little milk if necessary to make it a pouring consistency. Drizzle the dressing over the salad immediately prior to serving. Since I no longer have the book I cannot be certain of the original. I know the dressing was based on cream and quite rich so I changed mine to suit our tastes. I have also used pecan nuts which make a nice change from the walnuts. Canned mango may be used if you do not have access to fresh mango. Young loose-leaf lettuce is best but is you are using larger leaves you can roughly tear them into smaller pieces. Here is the salad without the dressing or the walnuts. Some of the dinner guests have food intolerance issues so I just serve the chopped nuts in a small side bowl to be added as desired. I usually drizzle the dressing over the salad at the last minute or it tends to become soggy. This salad has become a firm favourite with our family and friends and I hope you have an opportunity to try it out.